Liberal Boys Tennis finishes third at the Buhler Varsity Quadrangular. With one 1 st Place finish, one 2 nd Place finish, and two 3 rd Place finishes, Liberal finished with 18 team points behind Buhler and Andover Central. Valley Center rounded out the quadrangular in 4 th Place. #1 Singles—Josh Hamilton went 1-2 on the day finishing 3 rd Place. He lost to Tom Flynn from Andover Central 1-8, lost to /Buhler’s Nick Wilson (Grandson of Dr. Ray and Nancy Allen) 6-8, then defeated Valley Center’s Matt Dolezal 8-2 to take 3 rd Place. #2 Singles—Ozzy Villarreal—went 1-2 on the day finishing 3 rd Place. He lost to Andover Central’s Zack Lock 2-8, lost to Buhler’s Jesse Mitchell 2-8, then defeated Valley Center’s Corbin Bosch 8-1 to finish 3 rd Place. 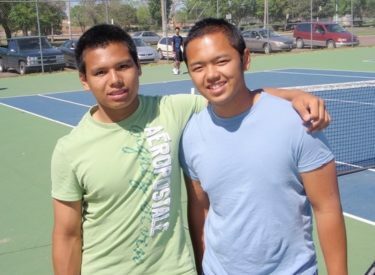 #1 Doubles—Vince Nguyen & Duc Nguyen went 3-0 on the day earning 1 st Place honors. They defeated Andover Central’s Bond/Adams 8-2, defeated Buhler’s Schmidt/Tyler 8-1, then defeated Valley Center’s Mayfield/Berning 8-2 for 1 st Place. #2 Doubles—Tony Rodriquez & Larcyn Carter went 2-1 on the day finishing in 2 nd Place. They lost in a tough tie-breaking match against Andover Central’s Gazda/London 7-8 (3). They defeated Buhler’s Gilkey/Frazier 8-3, then defeated Valley Center’s Horn/Milford 8-1 to finish in 2 nd Place. The Redskins travel to Dodge City on Thursday.